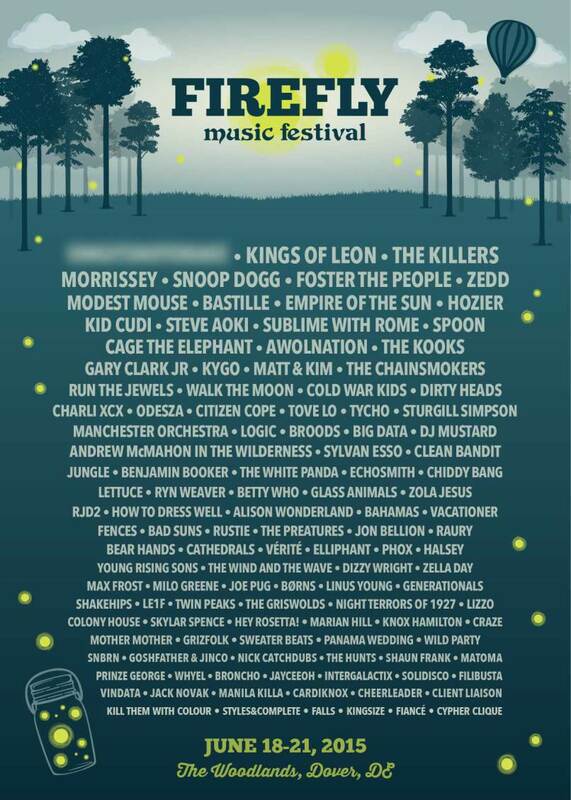 The lineup for the 2015 Firefly Music Festival has been announced, and it includes acts like Foster the People, Snoop Dogg and Zedd. Firefly Music Festival takes place at The Woodlands in Dover, Delaware. This year it will happen from June 18 through 21, and general admission tickets as well as VIP passes are available for purchase on the festival website. This year’s headliners include Kings of Leon, The Killers, and a currently unannounced third act, rumored to be Paul McCartney, according to Consequence of Sound. The lineup is full of recognizable names, such as Clean Bandit, Gary Clark Jr, Modest Mouse, Kid Cudi, The Kooks, Charli XCX, Walk the Moon, Tove Lo, DJ Mustard, and many more. Check out the full lineup – with the exception of the unnamed third headliner – below.